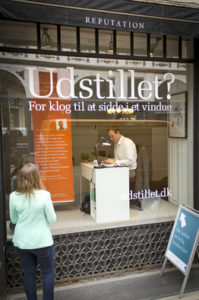 Danish job seekers sit in a window, hoping to catch employers’ attention. Catching people’s attention is what more than a dozen job hopefuls in Denmark’s capital are looking to do… After pounding the pavement for two years in some cases, highly trained professionals – ranging from lawyers to former CEOs to tax experts – are standing in line to get a seat in the “exhibit,” where people sit in the window of a store front with signs that advertise their qualifications. “I’m willing to try anything,” said Hannibal Camel Holt, an unemployed political scientist, as he took his place in the window one afternoon. Armed with a laptop computer and wearing a dark blue button-down shirt, Mr. Holt has been “kicking doors in and chasing leads,” as he puts it, on and off for four years, striking out despite qualifications that include speaking six languages. For him, sitting-in represented a necessary, albeit awkward step. “I feel like a monkey…in a cage as people walk by and just stare at me,” the former tax ministry employee said as he sat behind a desk and occasionally glanced at passersby. After he had recently missed out on a job that had attracted 265 applicants, he realized that “there comes a point when your CV (resume) is, like, dead.” A résumé, in other words, doesn’t necessarily do the trick. Before resorting to sitting in the window, Mr. Holt had worked with the program’s organizers to compose a video and create a Facebook profile that pedestrians could access by using a smartphone to zap a Quick Response bar code displayed on a banner next to the job seeker. Mr. Holt was slated for several shifts in coming weeks sitting in the window, joining 14 others planning to do the same between late April and early May. To pass the time, he planned to hunt for jobs online, update his curriculum vitae (CV — resume) and freshen up his social profile. Denmark has been insulated from Europe’s deepest economic problems because of its low public debt, but municipal finances are tight and wages have been under extreme pressure in recent years amid concerns about exports and low productivity. Unemployment remains relatively low [it was 4.4% in March], but for higher-rank employees it is a tough slog. DJOEF, the professional trade union behind the windows gambit, estimates that 41% of Danes with new master’s degrees are still searching for work one year after graduating. The organization thinks the root of the problem lies in a surplus of white-collar talent and a reluctance among small companies to hire in-house lawyers and other professionals. So the union is encouraging job seekers to take the initiative more aggressively. ISTANBUL | …Turkey’s cosmetic surgeons have for years offered hair implants to those who are balding on top. Now hair transplants for the face are growing in popularity, cosmetic surgeons and tourism agencies say, with men from the Middle East, Europe and Asia coming to Istanbul seeking an addition for the upper lip. 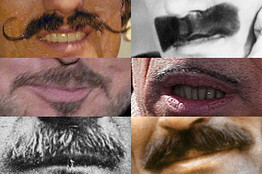 The procedure uses a technique called follicle-hair extraction, in which doctors remove clusters of hair from the more hairy areas of the body and implant them along the lip or cheeks to magnify a mustache or beef-up a beard. Performed under local anesthetic, the surgery takes around five hours and can cost up to $5,000, cosmetic surgeons say. Tourism agencies have begun offering “transplant packages” combining facial-hair operations with a shopping vacation in Istanbul or beachside retreat on the Mediterranean coast. Most customers are foreigners, according to surgeons, as Turkey’s emergence as a place for facial-hair transplants comes as the number of Turks wearing mustaches has declined sharply. Selahattin Tulunay is one of the surgeons profiting from this bewhiskered boom. From his surgery clinic in an upscale neighborhood known as Istanbul’s Beverly Hills, Dr. Tulunay started facial follicle transplants two years ago and now says he completes up to 60 such operations a month. 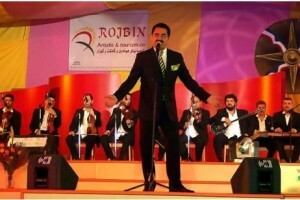 Surgeons say many patients request the full-bodied mustache worn by Turkish singer Ibrahim Tatlises, shown here in 2005. “The mustache is making a comeback. If a man’s mustache doesn’t grow, he wants to know he can have one as a mark of masculinity,” he said, leafing through a photo album showcasing his most-prized creations. “Our customers know that if they pay, we can deliver the results,” he said. A 34-year-old businessman from Erbil, in northern Iraq, said he traveled to Dr. Tulunay’s surgery clinic after years of low self-esteem over the patchy hair growth on his upper lip. “The mustache is very important in our culture and my wife supported me to get the operation. Now I feel much better. I’ve recommended it to my friends,” he said. Facial-hair transplants are at the fringe of a broader health-care tourism boom in Turkey, which last year generated $1 billion in revenues. The number of visitors Turkey welcomed specifically for surgical procedures rose to 270,000 last year from 156,000 in 2011, according to data from a 2012 report by Turkey’s Health Ministry. b) What is the current unemployment rate in Denmark? c) What type of prospective employees are having trouble finding jobs? d) Would you resort to this method to find a job if you had been out of work for a year or two? Ask a parent the same question. b) This excerpt is a human interest story. Human interest stories differ from the regular news. In journalism, a human interest story is a feature story that discusses a person or people in an emotional way. It presents people and their problems, concerns, or achievements in a way that brings about interest or sympathy in the reader or viewer. What do you think about the topic of this human interest story? It was on the front page of The Wall Street Journal: interesting and worth reading, or a non-story? Explain your answer. Alexander Peitersen, managing director of Reputation, was one of the architects of the program and offered his agency’s windows as the display case for the unemployed. He has used the windows for a variety of campaigns – including a 12-hour karaoke competition two years ago staged to launch a new Microsoft Xbox product. He figured the venue would work well for a job hunter’s “exhibition” since there are many business professionals nearby. “Companies can get 50 applications every week and all of them start to look the same,” Mr. Peitersen said, while sitting in an office not far from the job seekers sitting in windows. Mr. Peitersen, running an office with 36 creative staffers, said he has learned to appreciate go-getters, especially in a place like Denmark, where a social safety net and generous unemployment benefits shield many young people from the harsh realities of business. “I was sitting at my desk one day and my phone rang,” Mr. Peitersen recalls. “Some guy on the other line said, ‘Hey, I’m at the Barresso [coffee bar] and I’m ordering coffee now, what’s your favorite?’ ” Mr. Peitersen took the bait, ordering a double latte and eventually taking on the caller as an unpaid intern. The windows stunt appears to be working. Organizers have extended a two-week run to accommodate demand from job seekers. She got a job in a week. Ms. Werenskiold, a former CEO in a school district who has a master’s degree in public administration, was laid off in 2011 after spending two decades in the workforce without ever having a problem finding work. But out of a job in a tough economy, she got on a plane to Honduras for 10 months on a religious mission. “I came back to a crisis and it seems to have gotten a lot worse,” she said. With hard times in mind, she put a dancing shoe in the window along with a CD of gospel music for good luck and to tell onlookers something about herself. The mustachioed and bearded stars of Turkish soap operas – wildly popular across the Middle East, North Africa and the Balkans – have helped repopularize facial hair as a symbol of virility and machismo. Surgeons say many patients request the full-bodied mustache worn by Turkish singer Ibrahim Tatlises, which has long set the standard for top-drawer whiskers. Another popular style is the stubble beard worn by Turkish TV show heartthrob and model Kivanç Tatlitug, surgeons say. “My patients often bring pictures of the stars they want to look like, but I never do what they say because it wouldn’t suit their face,” says Canan Melike Koksuz, a surgeon at Isom, an Istanbul cosmetic surgery practice, which says it has welcomed chief executives and celebrities from as far away as China and Australia for hair transplants. According to surgeons and agencies specializing in transplant tourism, the vast majority of the clients come from the Middle East, where facial hair still bristles with political meaning. To be clean shaven has for decades been a political statement of solidarity with the secular, Westernizing elites who were pre-eminent across much of the Arab world until the series of uprisings that came to be known as the Arab Spring. Despite Turkey’s emergence as a hub for facial hair transplants, the number of Turkish men wearing mustaches has declined rapidly, according to pollsters. A study by Istanbul’s TNS Market Research Company found that while 77% of Turkish men had mustaches in 1993, the figure fell to 34% in 2011 and is still sliding. The number wearing beards, by contrast, has risen to 24% from 18% over the same period, a sign for some that the country has become more religious under the decadelong leadership of the Islamist-rooted Justice and Development Party. The grand mustaches of Turkish lore are these days a rarer sight in Turkey’s gleaming office blocks and sprawling shopping malls. But many Turks still balk at the prospect of surgery to thicken one’s whiskers.